Pretzels, peanut butter, and honey — these all evoke feelings of comfort and tasty snacking. Blend them together with banana and milk, and you have a pretty healthy, drinkable snack! 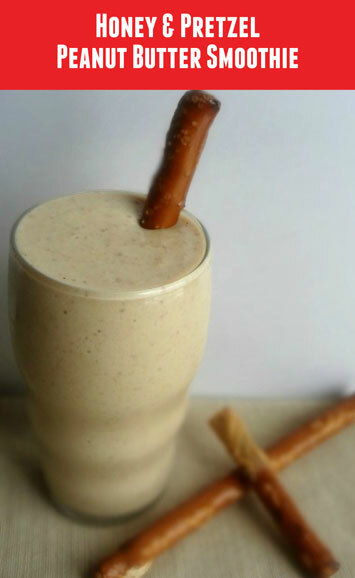 Pretzels are a great low-fat treat and add a salty element to the sweet smoothie while honey, in addition to its sweet flavor, also lends antibacterial and anti-inflammatory properties to the mix. And of course, the delicious protein power of peanut butter and the nutrients from milk and banana round out this perfect smoothie. 1. Place pretzels in a plastic bag and use a mallet or rolling pin to crush. Measure out 1 cup of the crushed pretzels and place in a blender. 2. Add frozen banana, peanut butter, honey, and milk to the pretzels. Cover with blender lid and blend until smooth. Pour into a glass and enjoy! The post Honey & Pretzel Peanut Butter Smoothie appeared first on - Peanut Butter & Co. Recipe Blog.